Whoa! It's been awhile. Somewhere in the chaos that is life, I couldn't seem to find my blogging inspiration. I blame it on the "busy" that life is sometimes. And that seems to be the common thread in some of my posts - being busy. I don't consider myself to be much of a writer - meaning, my love (or lack thereof) of writing is not why I blog. This thought sometimes keeps me from blogging because I don't feel like I have any real wisdom or special messages to relay. I think I enjoying blogging because I enjoy talking and there just isn't enough time in the day to talk to everyone! On the flip-side, who really wants to read about my life anyway? Then I remember why I started this blog: to let my friends and family, especially those that I no longer live near, know what's going on in my life, with a military husband and three kids. And to hopefully connect with other military families, too. I'm thankful for all the new connections in my life, military and non-military alike. 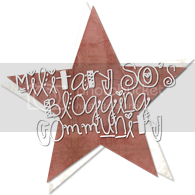 As much as I enjoy and relate to the military spouse blogs that I follow, I also realize there's so much to relate to with lots of bloggers out there! So, stay tuned...I've got some things to share with all of you! Nice post! I love reading your blog too! Although my hubby isn't in the military, I can soo relate because my dad served 21 years in the Navy. Fun Times! Thanks so much for sharing with us @ My favorite Posts SHOW OFF Weekend Blog Party!